This month I finally got around to reviewing Pocket Mobile. Overall, I found the service works well, and I can recommend it under certain circumstances, but there were some issues. Take a look at my review below. Red Pocket Mobile is a prepaid wireless company. In the industry, the are what is known as a Mobile Virtual Network Operator, or MVNO for short. This means they don’t own their own cellular data network of towers, instead they lease service in bulk from the big four wireless networks, Verizon, AT&T, T-Mobile and Sprint. Red Pocket handles all the sales, marketing, support, and billing but if you use Red Pocket Mobile your phone will be using one of those four networks. In general this is a good thing, because it means that in most circumstances you can bring your own Verizon, AT&T, T-Mobile, or Sprint phone to Red Pocket and it will be compatible with their service. It also means you can buy a discount monthly prepaid wireless plan and still get roughly the equivalent service you had on one of the big four. My goal was to try Red Pocket Mobile with my iPhone 5s, Google Nexus 5, and Nokia Lumia 920 with their AT&T compatible network.Unfortunately my Lumia 920 stopped working, it doesn’t recognize SIMs anymore so I was unable to use it for this review. 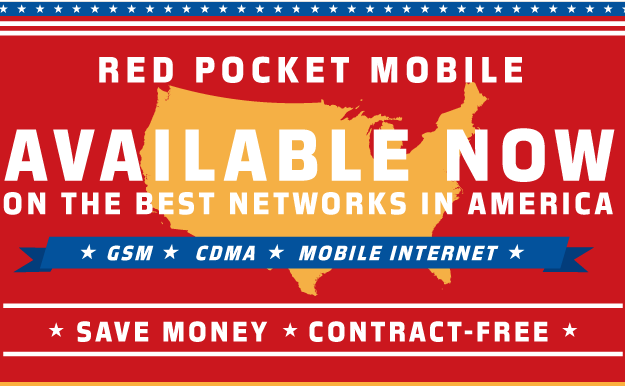 When you sign up for Red Pocket Mobile, you need to choose one of their four networks: GSMA, CDMA, GSMT, or CDMAS networks. These four networks are their AT&T, Verizon, T-Mobile and Sprint networks respectively. According to their web site, their GSMA, GSMT, and CDMAS networks all support 4G LTE. That leaves just their CDMA, or Verizon network supporting 3G. Since I was signing up for their GSMA service, I needed to buy a SIM for my phone. I wanted to buy a nano SIM because that is the correct size for my iPhone 5s. I could still use the nano SIM in my Nexus 5 and Lumia 920 with a nano to micro SIM adapter. You can buy a Red Pocket Mobile SIM in a retail store like Target or Best Buy or order it online from their web site. I looked in both Best Buy and Target but they only had a Bring Your Own Phone package with a standard / micro SIM and $50 service card. I ended up ordering the GSMA nano SIM directly from the Red Pocket web site for $9.99. It took a few days to arrive in the mail. After I decided on the Red Pocket GSMA network, I reviewed their unlimited plans. I decided to sign up for the UNLIMITED EVERYTHING $49.99 plan. With 1GB of high speed data, this is significantly less than the 3GB of data you get with Straight Talk or Net10 for $45 -$50. I will note that Red Pocket has different plans for their GSMT, CDMA, and CDMAS networks. Some of those plans looked more competitive than their GSMA plans. It’s been rumored that AT&T charges MVNOs like Red Pocket more for service than then T-Mobile, Sprint and possibly Verizon too, so its entirely possible Red Pocket can offer more value with GSMT, CDMA, and CDMA-S plans. Rather than discuss those other plans in this review, I plan to write a follow up article. I signed up online from the website and transferred one of my phone numbers to Red Pocket Mobile. I could be wrong, but I think most people transfer their existing number when signing up for prepaid wireless so I think any review should include that step. The sign up process did not go smoothly. I needed to call Red Pocket for support. I waited on hold for a short period of time, but the support representative was helpful and spoke perfect English. I didn’t ask her what country she was located in, but I suspect the Philippines. Continue reading on if you want the details of the sign up process or you can skip to the next section. From my web browser, I went to the Red Pocket Mobile website and clicked Activate. I entered the SIM ICC ID# printed on plastic card my SIM was attached to and clicked submit. This takes you to the next page of the sign up process. I entered my Activation Type, SIM ICC ID#, Email, and Zip code as mandatory fields. The Activation Type is the type of plan you want to sign up for and you can choose from a list. I chose Red Pocket Unlimited. Your SIM ICC ID# was already filled in from the last screen. 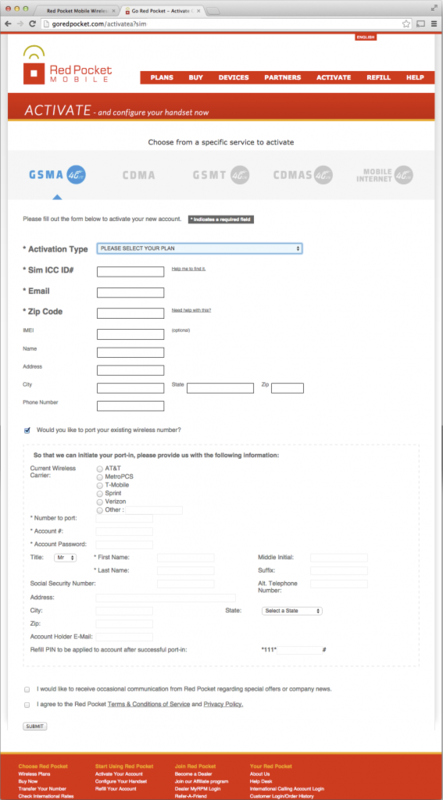 The form also had optional fields for IMEI, Name, Address, City, State Zip and Phone Number. I would like to receive occasional communication from Red Pocket regarding special offers or company news. The second option is simply to opt into promotional emails from Red Pocket. The third option in the typical terms of service you need to agree to when signing up for any service. I didn’t read it. Does anybody read those? The first option is important. Porting your number is phone company lingo for transferring your existing phone number. As I said earlier, I’d be transferring my number. When you check this option, the form expands with a lot more fields for you to enter. These include: Current Wireless Carrier, Number to Port, Account #, Account Password, Your name, Social Security Number, Address, City, State, Zip, Account Holder Email, and the Refill PIN to apply afer Port in. Now that is a lot of information! The reason for this is they may use this information when contacting your current wireless company to transfer your phone number. The number to port is the phone number you want to transfer. Your account number and Account password are the account number for your current wireless company and your account PIN if set. The PIN or password is what your wireless company uses to prevent someone from hijacking your phone number. If you don’t know your Account Number or Password, call your current wireless company to find out what they are. I filled out the form and clicked the Submit button. The next screen displayed a message that my port was in progress and I’d be contacted when complete. I had the feeling that something wasn’t right. First, I kind of assumed that as part of this process I would have been guided through setting up an online Red Pocket account and I wasn’t Second, I didn’t receive any email from Red Pocket, confirming that I signed up. Third, and most importantly, my old phone was still active, and my Red Pocket sim was not active. I waited for 30 minutes or so, taking notes for this review. Finally I decided to call for support only to find my port wasn’t in progress. The support representative was helpful and and completed the process. I went for walk, and my old phone was dead and the Red Pocket SIM was active but without service. As part of the sign up process, I never bought airtime or picked the exact plan I wanted. I have to admit I am still confused by Red Pocket’s online customer account. I thought I’d be able to create an online account, add device / phone number / SIM to the account and be able to manage it from that login. It doesn’t see to work that way. When I want to check the balance on my phone, I have to enter my phone number, the last four digits of my SIM, and a three digit Captcha code. Somehow I managed to pick a plan for my phone and get it activated. I ended up paying $54.99 for a Unlimited Talk, Text, and Data account with 1.5 Mbps of high speed data. I originally was planning to pick a $49.99 unlimited plan with 1GB of high speed data but that option wasn’t available. I found the Straight Talk, Net10, and H20 wireless online accounts much easier to use and understand. That said, all my phones on other carriers are on auto pay meaning my credit card is automatically charged when I need to refill my service. I rarely log into my online accounts and usually when I do its to figure out the answer to a reader question on smartphonematters.com. With the sign up process behind me, I was able to put the Red Pocket SIM in my Google Nexus 5. I went into the settings and entered the APN setup information and saved it. Voice calls worked. Call quality was good. Next I tested sending and receiving SMS text messages and they worked without issue. I disabled the Wi-Fi on my phone and test cellular data. It worked, but I noticed I was getting a 4G HSPA+ connection not the 4G LTE I expected. I checked the web site again to make sure Red Pocket GSMA really offered 4G LTE. After carefully reading the web site again, I noticed the $50 unlimited plan is advertised as high speed. It turns out that only Red Pocket’s $70 Unlimited Plan with 4GB of high speed data supports 4G LTE. I called them and confirmed. I was disappointed. The website should be clearer regarding this point. I personally don’t need 4GB of data a month, so I wouldn’t want to pay $70 a month to get 4G LTE. This was the biggest disappointment. Next up, I checked to see if I could send and receive MMS picture messages. MMS worked in both directions with out issue. I get many requests from both Straight Talk and Net10 customers to help with MMS issues so its refreshing to see this just works. I have not tested group texts yet. I’ll update this section when I get a chance to try it out. I was able to send and receive SMS text messages without issue. I was able to use cellular data on my iPhone 5s. As I mentioned above, the data connection is only 4G, not 4G LTE. Setting up cellular data, however took an extra step. Normally when you set up cellular data you go the the Cellular Data Network page in your iPhone’s settings. But with Red Pocket, you can’t do this. When your iPhone detects a SIM that is using the AT&T network it automatically sets up the APN and then it hides the Cellular Data Network page in the settings. The problem is that when you use Red Pocket, it sets up the APN incorrectly. This isn’t just a problem with Red Pocket, many other prepaid wireless companies that use the AT&T network have this problem too. The solution is to install an APN profile which sets the correct APN. Using Safari on my iPhone, I visited the RedPocket web site, at http://goredpocket.com/configure, clicked Configure Now and installed the APN profile. Unfortunately, MMS picture messages and group texts did not work with Red Pocket Mobile. The issue is that there is no way to configure MMS because the Cellular Data Network page in your iPhone’s Settings are hidden. The APN profile that I installed to set up data only sets up data, not MMS. That’s not Red Pocket’s fault, its a limitation imposed by Apple. It would possible to set your MMS APN and get MMS picture messages if you are willing to jailbreak your iPhone. Most ordinary users are not going to jailbreak their phones and you shouldn’t have to to this just to setup your MMS. It wouldn’t be a smartphonematters prepaid wireless review without running Speedtest to measure the RedPocket’s network performance. With that said, below is a video I made showing the results. The results consistent with what I’d expect from a 4G HSPA+ connection on the AT&T network in my area. So after looking at Red Pocket Mobile there were some things I to like and some things that were disappointing. So would I recommend RedPocket? Yes for the right user. For someone using an Android phone that doesn’t support 4G LTE like the Motorola Moto G or a number of the BLU smartphone models the lack of 4G LTE isn’t an issue. Red Pocket GSMA might also be a good choice if MMS picture messages are a really important feature for you, more important than the amount of data you get with your monthly plan. Right now, I don’t think Red Pocket is the best deal for iPhone users however. With the GSMA network, you cant setup MMS picture messages. You are better off with a plan that gives your more data for your money. Do you have a question or comment about Red Pocket Mobile? Leave a comment below and share. I currently use T-mobile but my phone is unlocked, and I occasionally travel to a rural area where T-mobile doesn’t have coverage. AT&T and Verizon do, and the Red Pocket GSM coverage map says it does. My question is… I don’t want to switch providers entirely, I just want to be able to put in a Red Pocket SIM card (with a new number) when I’m going to an area with no T-mobile coverage, then when I leave just put my T-mobile SIM back in. Do you know if I can do that? You can do this, it should work. I am not sure what phone you are using, it needs to support ATT’s network. Not all TMobile phones do. Be careful with coverage maps though. I usually like to say they are better at telling you where there isn’t coverage than where there is. What type of plan do you need for this rural area? in terms of minutes,data, etc. There are a bunch of prepaid options that use the ATT network. You need to find one that make sense for you. And are you using TMobile prepaid? You also want to make sure that Verizon and AT&T coverage in these areas actually comes from these two companies respectively. Sometimes ATT and Verizon have a deal with a local phone company to carry their traffic in rural areas. And when this is the case it usually doesn’t work with prepaid accounts. I have yet to try an mvno from TM that actually broadcasts an LTE signal. And i try many mvno’s to tell followers on youtube. I was able to get LTE using my Android phone using Straight Talk. It might be that TMobiles LTE coverage isn’t good in your area. I found this article very helpful. I just got an Iphone 5 and am under the GSMA plan. I discovered, like you mentioned, that I was not able to send picture messages or group messaging to people without Iphones. I contacted Red Pocket about this and they seemed very confused at first. But they told me that the GSMT sims card would allow customers to configure their APN. Do you know if this is true? Is it really just the sims card or is the issue with apple’s setting? Yes this is true. Your phone needs to be set up to use MMS to be able to send & receive picture messages and group text messages to people that don’t have iPhones. Your phone uses iMessage over Wi-Fi or your cellular data to exchange these things with other iPhones. The problem is with both ATT and Apple / iOS. Apple has a feature that ATT is using so that whenever you put any att network SIM in your iPhone it recognizes the SIM as for the ATT network, sets up your APN settings automatically, and then hides the Cellular Data Network page in your Settings so you can’t change them. The problem is that the phone sets the APN for ATT, not Red Pocket using the ATT network. So the values are wrong and you can’t change them. You do have the option to install an APN profile, which is able to set up your data or internet connection but not MMS. When you use any TMobile network SIM, the Cellular Data Network page in settings is visible and you can set up your APN for MMS. So does this mean you should simply change to Red Pocket’s GSMT plan? Not necessarily. If you are using an ATT model iPhone, you phone will need to be unlocked to be able to use the tmobile network. If this was your phone and your ATT contract is paid off, ATT will unlock the phone for free. SeeUnlocking Your AT&T, T-Mobile, Verizon or Sprint iPhone, Android, or Windows Phone. The next issue is does the T-mobile network have coverage in your area. In the last few years TMobile has done an incredible job updating their network and in many areas of the country its as fast or faster than ATT. But if you are not in one of these areas you may not have coverage or only get slow 2G data. 1. 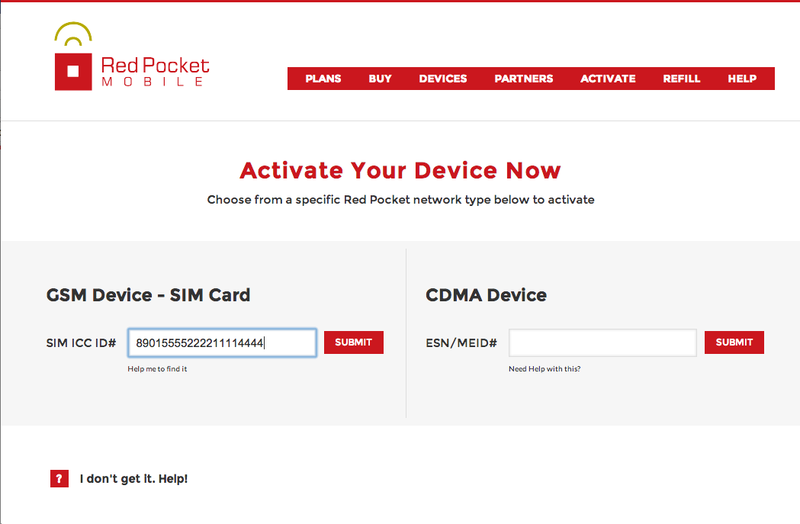 You can try switching from Red Pocket GSMA to their GSMT network and see if it works. I don’t know how hard this is. With Net10 and Straight Talk its pretty easy. 2. Switch from Red Pocket to Straight Talk or ATT Prepaid or Cricket wireless which will set up the phone correctly for MMS on the ATT network. Make sure to spend some time reading smartphonematters to learn about these other options. And some other options, which are not that good. 5. You can jailbreak your iPhone. This is basically hacking your phone so you can install software that isn’t approved by Apple. Including an App that will let you set your APN so MMS will work.